The Kellog system is home to a stark dichotomy. Kellog II (“Xis”) has been designated by the UEE Subcommittee for Development & Expansion as a Developing World to a primitive species. A lush jungle paradise world, Xis would be otherwise ideal for human colonization. There is a small market for medicines and other organic goods collected with some risk on the planet’s surface. Flo-pets, the focus of a brief exotic animal fad among Earth’s upper class, were initially illegally trapped here. Meanwhile, the outer planet in the system is the infamous QuarterDeck PrisonWorld, a maximum security penal facility home to hundreds of thousands of hardened criminals. The UEE allows prisoners at QuarterDeck to work their sentences in a full-process antimatter refinery; the fuel is thus available cheaply and raw materials involved in its creation are sometimes at a premium. Bounty Hunters should note that QuarterDeck’s booking officers are known to pay a reasonable rate for captured criminals. Though it sits on the border of Vanduul space, the system is under heavy watch for two other reasons. The first is the discovery of life on Kellog II (Xis) which placed the planet under the protection of the Fair Chance Act. The second is that the UEE converted the system's last planet into the prison world QuarterDeck (Kellog VI). However, frequent trips into the system by bounty hunters and haulers make it the busiest developing system in the UEE. The Kellog System consists of six planets orbiting a G2V yellow dwarf extremely similar to Earth’s own Sun. 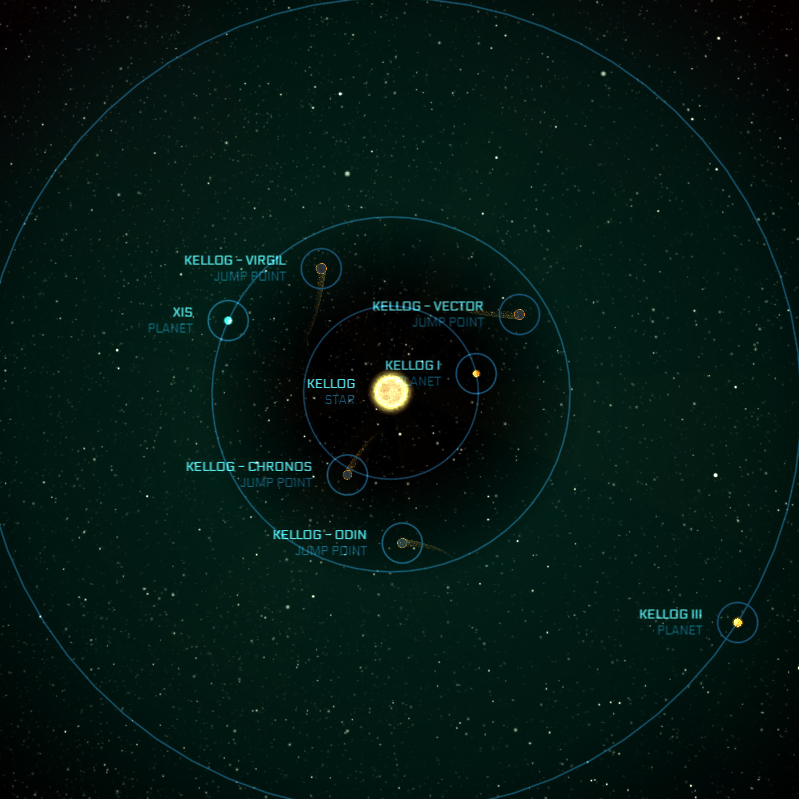 Two of these worlds are inhabited and offer attractive trading opportunities to the interested trader: Kellog II, known as Xis, is slightly closer to the star than Earth, creating a lush tropical paradise world. Kellog VI is at the outer edge of the system’s green band, a barely inhabitable rock which the UEE has converted into a prison world. A visit to Kellog is not for the faint of heart. The system is ranked SIX on the galactic insurance chart, meaning that should loss-of-vehicle occur there, there is no repayment of cargo fees and upgrade replacement would be available only at a slight loss. There is nothing necessarily dangerous in the system itself, particularly for lawabiding pilots, and the rating instead reflects a simple truth: there are limited reasons an honest person should be there in the first place. Travel Warning: The Kellog System is located near what is generally considered Vanduul territory. Although the organization of Vanduul “tribes” is still not well understood, it seems that none have claimed Kellog as their own … yet. Although no enemy raiders have yet been spotted in-system, travelers are advised to take extreme precaution in the region. Kellog is a system with an immense opportunity for profit … but it is one that inexperienced merchants should avoid at all costs. Hundreds of interested newbies have noted the profit margins and afterburnered straight to the system — only to find themselves the target of the UEE forces guarding QuarterDeck or a tasty dinner for a Xisian seacrab. Don’t make their mistakes: equip your ship properly, focus on stealth when dealing with any black market shipping … and tread lightly, wherever possible. Kellog is a Main Sequence Dwarf-G star. Located close to the system's star, the planet's surface is molten lava. Xis (Kellog II) is a biologically diverse terrestrial world. It is home to the Orm, a primitive hominid-species that has earned the world protection under the Fair Chance Act. The planet's jungles and warm seas have given rise to a wide variety of interesting life forms, which the UEE is dedicated to keeping off the black market. A smog world featuring a thick atmosphere that is completely inhospitable to Humans. Surveys of this super-Earth revealed potential resources, but with its location near a Fair Chance Act planet and a major prison, access to the world has been limited. A gas dwarf with a rocky core and a thick, expansive atmosphere that is not ideal for refueling. An icy desert world that the UEE has turned into a prison. QuarterDeck houses hundreds of thousands of hardened criminals from across the Empire. An antimatter facility on site is staffed by prisoners sentenced to do labor. Located in one of the QuarterDeck's Lagrange points, this satellite is the central processing center for the prison world. Assigned to monitor the primitive species on Xis and protect them from outside influence, OB Pegasus is staffed by scientists and military personel. Located at the system's edge.